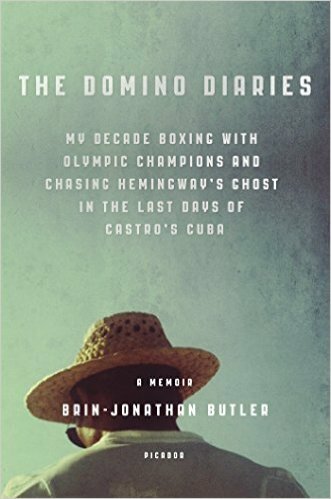 When I recently came across The Domino Diaries: My Decade Boxing with Olympic Champions and Chasing Hemingway’s Ghost in the Last Days of Castro’s Cuba (Picador, 2015) by Brin-Jonathan Butler, I was attracted to the cover. But what really sparked my interest was the subtitle. I’ve been fascinated by Cuba from a young age and am always up for a good memoir set there. With the opening of US-Cuban relations happening like right now, I was especially curious to read about the author’s decade in Cuba (2002-2012). Brin-Jonathan Butler was born and raised in Vancouver, so never faced the travel restrictions that we in the US have had for more than half a century. What I love about this book–one of many things–is that Butler writes about Cuba without the bias of US propaganda. Butler got into boxing as a teenager in Canada as a response to a bullying incident. At one point some years later, his mother gave him some inheritance money from his grandfather and said he could go anywhere he wanted. Why Cuba? It was known for boxing and for Hemingway, as the subtitle suggests. Butler wanted to find a boxing trainer in Havana and track down the captain of the Pilar, Hemingway’s famous boat. At that point Butler had already made a name for himself as a sports writer, focusing on boxing. In fact, the book opens while he’s interviewing none other than Mike Tyson. But in Cuba, Butler goes a step further and decides to make a documentary about Cuban boxers who refused to leave even after being offered millions of US dollars to defect, as well as those that left for the big bucks up north. He wanted to find out which group led a more fulfilling life? It was not only difficult to contact these boxers, but also dangerous to talk to them and especially to film them. Other writers had tried to get close to these boxers, but the boxers either refused to talk or the authorities got to the journalists first. Butler knew he would be forever banned from Cuba if he were caught and certainly after his documentary, Split Decision, comes out. Even if you have no interest in sports, you will be drawn into this beautifull-written thrilling, raw, heartbreaking, and sensual book. And if you have any interest in the changing US-Cuban relations, this is a book not to be missed. You always make my “To Read” pile bigger! Thanks for the heads up!